Denon Prime 4, The Ultimate DJ solution ? QSC sounds like the future! Over the past 50 years QSC have cemented their place on the leader’s board on the forefront of innovation. In the past 20+ years QSC have re-shaped the industry with their inventive solutions to problems, both through technological breakthroughs and novel productions. QSC isn’t just on the cutting edge, they are sharpening the edge. 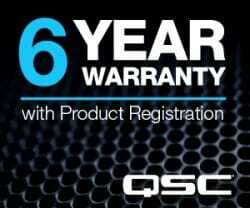 Here at phase one DJ store in the heart of the north east, we now stock a wide variety of QSC products. We have a Professional dedicated team who take great pride in reassuring you with the best possible solution to suit your needs. Whether that may be a Small compact music systems to an enormous rig we will ensure you get what you’re looking for, delivered in a professional and friendly manner. Phase one has been a solid stance in this industry since 1981 and we withstand a solid reputation in customer care. Come down to our show room based in Darlington and have a look, most of all have a listen! Is QSC the answer to all your problems? – QSC K range of speakers. QSC is built to impress, so do not hesitate to be impressed. Come on down the Phase one DJ store based in Darlington serving the surrounding areas of Newcastle, Durham and Teesside. Or simply just give us a call (01325 480507) were always happy to help. After all QSC is the cutting edge of innovation.